I've had my Silhouette Curio now for several weeks so I'm slowly beginning to see more and more major (and minor) differences between it and the CAMEO and Portrait. If you read my first impressions of the Curio (not quite a review) you know we got off to quite a rough start. 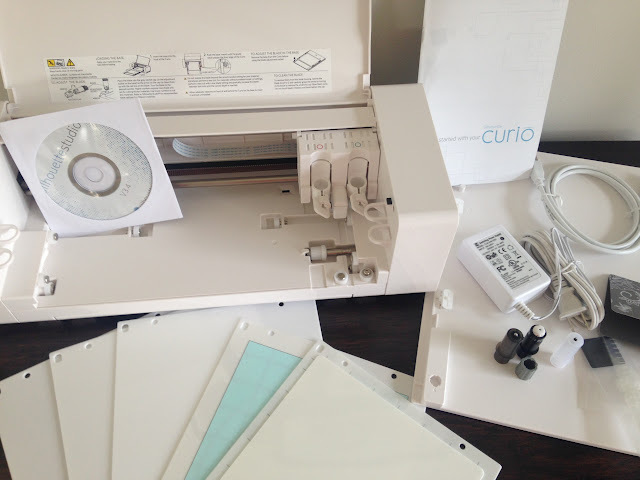 This post, however, isn't about what I like and don't like about the Curio, it's just about straight up facts so you can decide if you need to add a Silhouette Curio to your crafting tool belt. 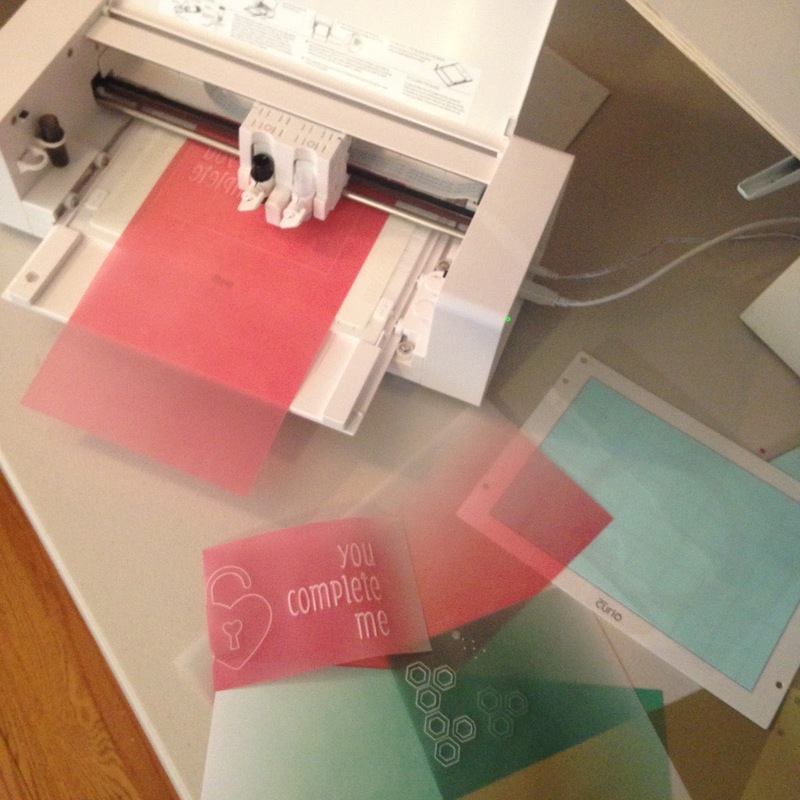 Scoring and embossing and etching on foiled cardstock worked similiarly on both machines. It's tough to photograph this paper, but I was pleased with the results. Here's another side by side...the results were so similar I had to write on the back of one of the sheets which machine cut/embossed it. With the Silhouette CAMEO and Portraits the users lines up the mats along a line on the left side of the machine, presses load material or load mat and the mat is pulled into the machine automatically by the rollers. On the Silhouette CURIO the users must manually pull the tray through to the back of the machine then press the load/unload button on the side of the machine.. At this point the CURIO will detect the mat and position it exactly where it should be to cut/emboss. When unloading on the CAMEO or Portrait the user pushes the "unload" button on the control settings and the mat is spit out. On the Curio the users must press the unload button on the side of the machine and physically pull the tray with the mat on it out of the machine. 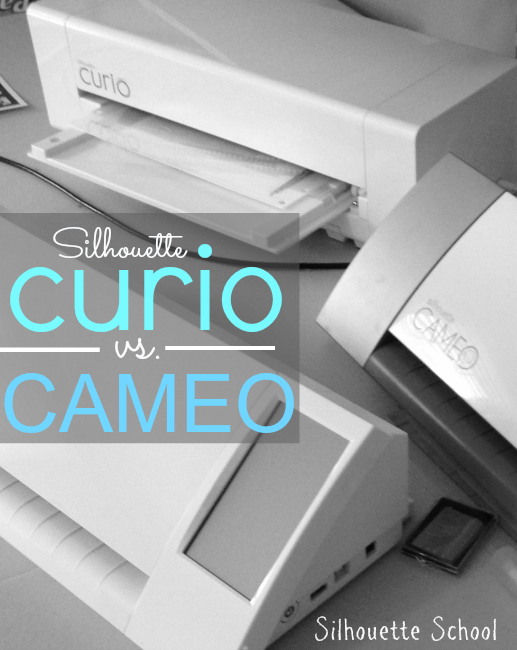 How did you put the Curio embossing mat on the Cameo? Thanks for the comparison of the two machines. Like Isabelle (above), I'd like to know how you were able to emboss with the Cameo. But, having posted comments on your blog before, I know you won't answer us - sigh! Okay, here is a geeky thought. I wonder if printer A/B switch would work on enabling the Curio's screens? The Cameo uses a printer/USB cable. I would like to know how to use my CAMEO to emboss! did you download the new software and used the base and embossing tip? Does it work easily? Because I read I would not be able to use the new software if a curio is not plugged in. Just got a Curio for my birthday (brand new to doing this) ... would you return it an get a Cameo instead if you were a newbie? Thanks! I would keep it and buy its big sister, the cameo. its a companion to the cameo, its not really supposed to take the place of your cameo, its a little friend for the cameo to play with. after a couple of months of saying "i don't see myself having a use for this" I actually caved in a bought it. 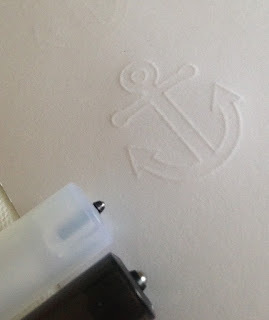 I took the time to actually watch a video on the embossing and stippling....i'm now eagerly awaiting my curio. (I can't play with it until Christmas though) I have to say I was actually impressed!!! I know the mat area isn't that big, not a 12x12, but honestly that really doesn't bother me. i'm make cards so the smaller work area isn't a big bug bear to me. I love the fact that now I can turn any design into a really good stippled sketch, I sketch with my cameo all the time, but I personally think the stippled effect can look better and it also fills in the font that you couldn't fill with the cameo, well you could but its a huge pain in the bee hind to do so. so yes after I watched a couple of videos ...I decided, lets just see what this little sister to cameo can really do. I am probably posting this in vain because people always say you never respond to comments, but maybe someone else will jump in! I just bought a Curio, but have not yet received it. I need to cut thicker fabrics, but on a small scale. I do not have the funds to keep this machine and buy a CAMEO. Can anyone tell me whether I should return the Curio and buy a CAMEO or keep the Curio? Thanks. I purchased the Curio to cut fabric, because My old Cameo would not cut. However the software does not work. The screens will not open up. I used Window 7 Pro. I should had gotten the ScanNCut. My husband gave me a coupon good for a Silhouette for Christmas this year and I'm really excited to get one! Do you offer any kind of discount code on your bundle? I am not finding the Curio user friendly at all. 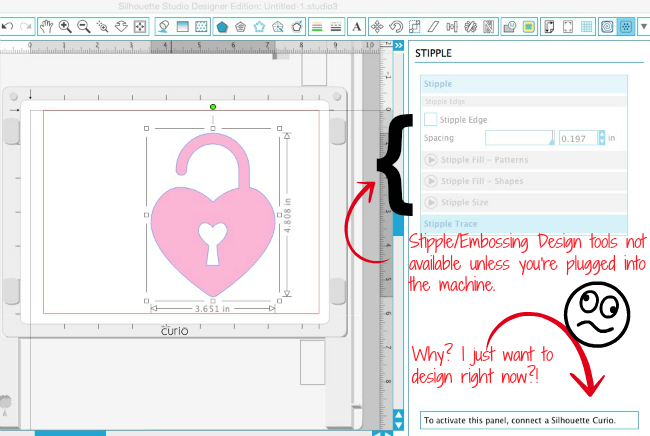 I am proficient in Photoshop but I am finding the Silhouette software confusing, and am super frustrated at the lack of tutorials out there. I have just found this blog and am so grateful. If it helps I won't have to return this machine. I've only had it a few days and it's already making me very cranky trying to figure it all out.